What does a broke American girl with 24 hours in Dublin do? Drink Guinness. Lots and lots of Guinness. I’m on my last stop of adventures here in Dublin before returning to the US after being gone a year and only had 24 hours here in this beer-drowned city. To get here was quite a struggle. First, I had to figure out how to get my two 50 lbs (each) suitcases around with me along with a similarly heavy carry-on and large purse. Yes, I traveled from Wales to Dublin with four massive bags all by myself. And I didn’t even cry once! So, that’s cool. But anyway, in order to even get to Dublin I hitched a ride, took a train, rode a ferry and then caught a cab to my hostel. Yes, that’s four different means of transportation with four very large bags that weigh more than I do collectively. Again, I reiterate – I DID NOT CRY ONCE. It was easy once I put all my weight into picking up one case and stacking it on top of the other so that I could wheel them together (my 2nd suitcase is actually a duffle and doesn’t have wheels) – and by easy I mean immensely challenging. I wheeled my two massive cases along together while toting my carry-on strapped across my front and my big purse across my back.. I’m telling you guys, I was a comic relief of travel to anyone who saw me. 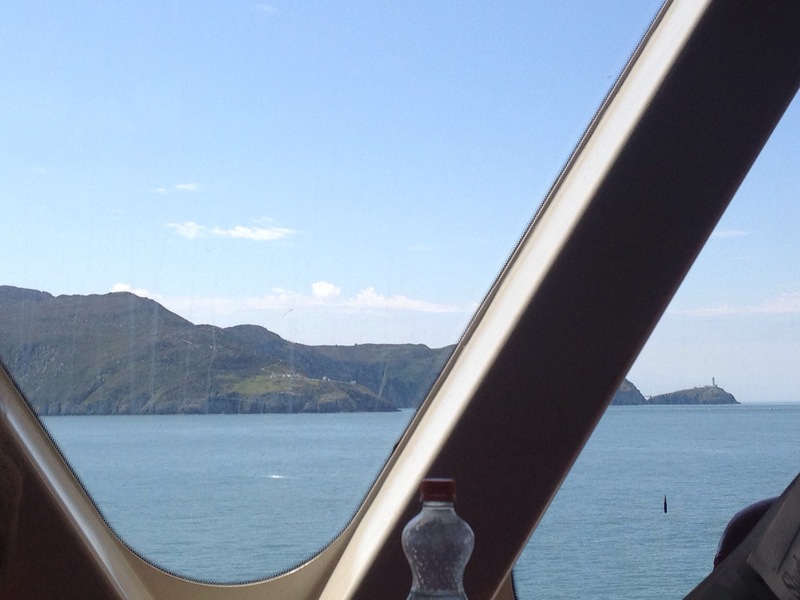 But all of this is okay because I got to take a ferry from Wales to Ireland! It was so cool! I love the water and honestly could have sat there at the big windows staring off into the horizon daydreaming about the world for a full day. 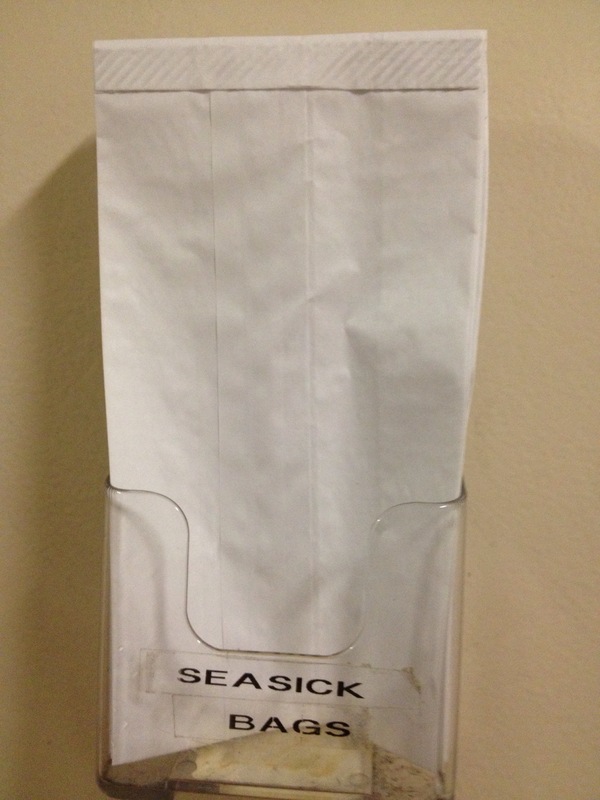 But I didn’t have a full day on the ferry – nope, I had a full day in Dublin! Literally just one full day. Actually, not even that because I arrived in the afternoon and am heading to the airport this morning.. So, technically more like 20 hours I guess but that’s okay! I made the most of it! While on the ferry, I met a fellow blonde American girl who I instantly connected with. She’s traveling with her dad and wanted some time away from him so we hung out on the ferry and exchanged info so that we could meet up together again later in the day. Once finally arriving at my hostel – bags amassed in front of me towering above me – I checked in and left to get some grub. I wandered around the town center for a bit as I always do and then happened into a pub that my cabby had told me he likes and is pretty chill. I look to a table to sit down. I hear a man call out for me. I turn and there’s a middle aged man sitting at the bar with an arm stretched out to shake my hand and he’s asking me where I’m from and what I’m doing there. Like seriously guy, I haven’t even looked at the entire pub yet and you’re already bugging me. But turns out he wasn’t really that annoying and he and his buddies were actually pretty cool. They find out I’m from the US and traveling alone (shh, don’t tell my Mom that I told them that) and they are shocked. They can’t understand that an adventurous and independent woman wants to travel alone and experience the world. But that’s okay – a lot of people don’t understand it and I’ve grown used to it. The guys end up buying me a Guinness and we chat while I scarf down yummy fish and chips all afternoon. 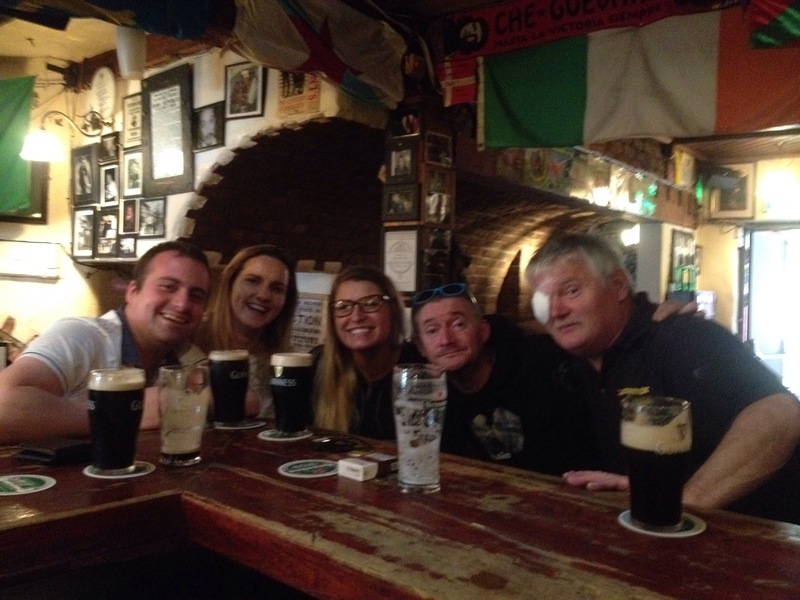 What started out as an encounter with an annoying dude in a pub, turned out to be quite the perfect Irish experience with beer and fish and chips. Later my fellow blonde American friend, Robin, and I went out on the town together to Temple Bar. We ate, we drank, we were merry. 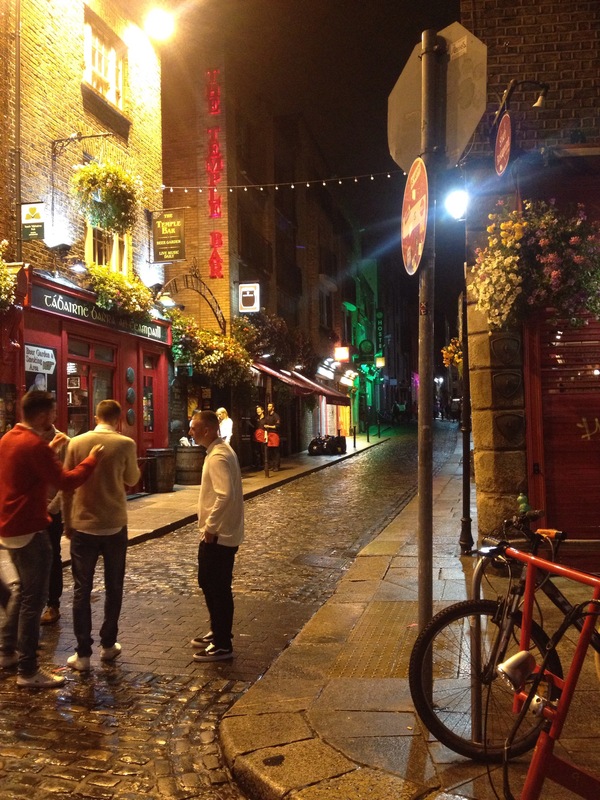 It was so cool to just walk around and see the nightlife of Dublin. 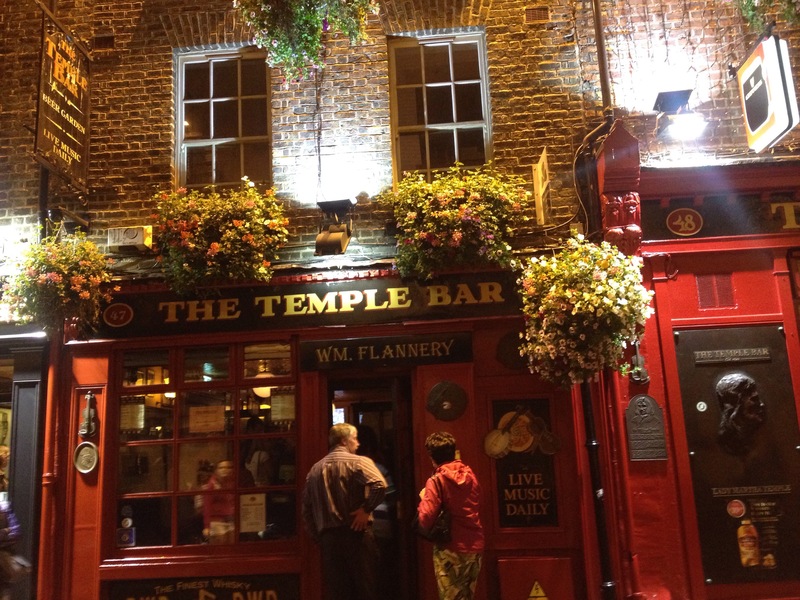 Cobblestones and neon lights take precedent at Temple Bar and there’s really nothing like it. We had ourselves a grand ole’ time. 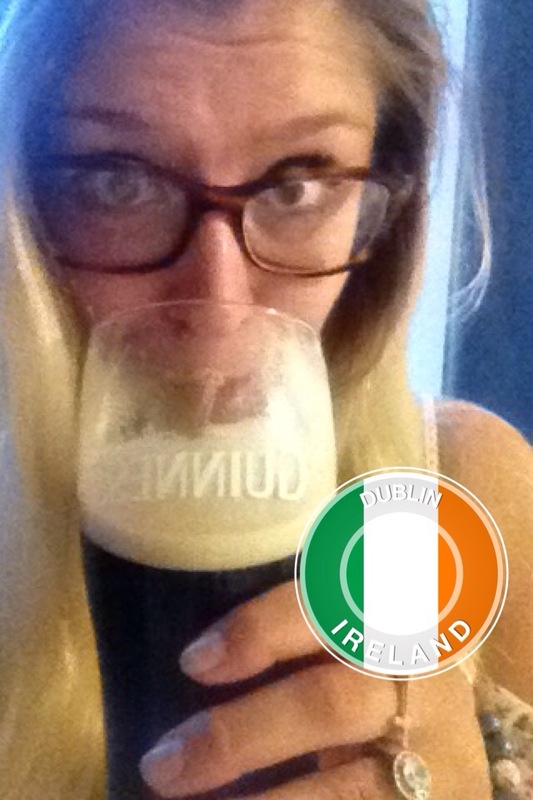 The only thing I’m bummed about is the fact that I wasn’t able to go to the Guinness factory. I arrived too late yesterday to make it in time and then have to head to the airport too early this morning to go today. But I know I’ll be back one day so it’s not the end of the world..
And now today, after countless adventures and memories over the past year, I’m leaving Europe and returning home.